William Herschel just beat Australia. He died in 1882 but it was he who contorted Brad Haddin's face, encouraged the England players to cheer and forced Marais Erasmus to tell Aleem Dar he'd made a mistake. William Herschel was the man who discovered infrared. It was infrared and quality stump microphones that beat Australia. That and Jimmy Anderson. When he's showing you what he is doing, Anderson is really good. When he is hiding what he is doing, he's terrifying. Statistically he was half of England's wicket tally. In person he was almost all of it. Anderson took down the great Ashton Agar. He delivered him the kind of ball that you save for people who can ruin your life. Around the wicket, close enough to make you play, moving the prefect amount, and taking the right amount of edge. Without a sterile room and a scalpel, this was about as perfect as surgery gets. Australia's Skywalker was gone. Three innings ago Mitchell Starc made 99 in Mohali. In the middle of a 4-0 whitewash, in a match Australia would lose by six wickets, he smashed the ball everywhere and all but pulled off a hundred from No. 9. Like many Aussie tailenders, he couldn't convert his start into a hundred. This time Jimmy was clearly not looking for any fun from Starc. Starc couldn't have looked any less comfortable facing Anderson if Jimmy was operating a flame thrower. Peter Siddle's batting usually has two things, solid full-faced defence and the occasional stylish stroke through the offside. He doesn't make many runs, but he isn't easy to get out. Off Broad he took two boundaries, when he tried to do anything resembling that to Anderson he lost his wicket. Anderson only had eight balls to James Pattinson, mostly in his 13th straight over. His pace was down. On one ball, that Pattinson hit for four, it looked like Jimmy was dragging a washing machine through the crease with him. He had bowled himself into the ground; he produced the sort of spell that ends fast bowler's careers, while making them legends. Shortly after he limped off the ground like he had a chastity belt made of concrete around his waist. That was when this became an actual game. Without Jimmy, Australia fought back. Brad Haddin embarrassed Steven Finn. Pattinson embarrassed the techniques of most of his top order. Finn dropped a catch. Swann bowled full tosses. Australia edged closer. A nine-wicket cricket match is not like other sport. Your brain does not know how to understand it. It can be over at any stage. Your ears make up noises. Your eyes can't be trusted. It's like watching a tortoise cross a ravine on a tightrope. A bump ball can make you make you cry. You hear noises that can only be bails falling off. Every other single noise is an edge behind. A skied catch can take 17 years to find a hand. Every single defensive shot could spin back off the pitch into the stumps. You actually stop breathing and at any point you can't see the ball. That all happened to me. It was like the game hijacked my senses. Every time Pattinson leaned forward with a perfectly straight bat to defend, I saw an edge. A skied shot from Haddin just went missing in the sky; I kicked my desk trying to find it - I am still positive I saw the ball drop safely into Finn's hands. But what actually happened is that tortoise happily moved across the ravine, getting closer and closer, until Jimmy came back into the attack. It doesn't really matter if Anderson is the most skilful bowler on earth, or even the Grand Poobah of the Loyal Order of Water Buffaloes, he's just really good. Anderson won this Test. Forget edges, infrared technology, and umpiring errors. 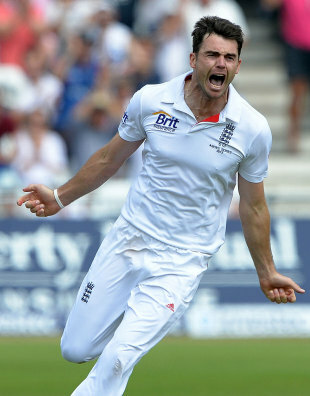 Remember Jimmy Anderson. Remember him taking the wicket of Australia's bravest warrior, a man who was ignored for years, underperformed for a time, and worked like a possessed man for that one last chance. A man who had pushed Broad aside. Mocked Finn. And kept out Swann. A man who had dragged the corpse of the Australian batting line up within 15 runs of victory. A man who stood his ground even when he knew he was condemned. Because he just couldn't walk off. He couldn't leave until they made him. He wasn't made to leave by infrared, stump mics or Erasmus. It was Jimmy who done it. He was the man who shook the tortoise off, and the reason it was there in the first place.